Preheat oven to 350 degrees F. Butter an 8" pie pan or round cake pan. Beat together cream cheese, eggs, 2/3 cup sugar, and 1 tsp. extract until smooth. Pour into prepared pan and bake 25 minutes. Be careful not to overbake. Remove from oven and cool for 20 minutes. 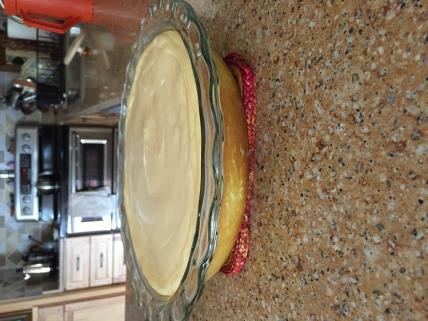 While cheesecake is cooling, mix together remaining ingredients (sour cream, 3 Tbsp. sugar, and 1 tsp. extract). Spread on top of cooled cheesecake. Return to oven for 10 minutes. Chill and serve.